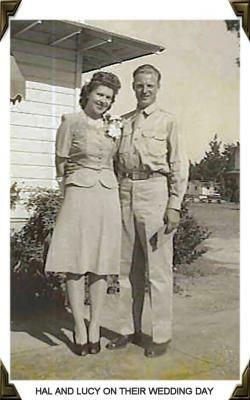 Harold John Teachenor was a World War Ii veteran who meet my mother, Lucille Robbins Allen, on a troop train and married her at Camp Livingston (Army) in Louisiana in 1944. They initially lived in Pontiac, Oakland Co., Michigan with Lucille's two sons from a previous marriage. After the births of their two daughters they moved to Chicago, Cook Co., Illinois and lived in the same building with Ethel Carr Teachenor - his mother. The marriage ended in divorce in Chicago. He was a proud member of the VFW Post on North Clark Street in Chicago and took me there many times. He was always looking out for his fellow veterans. He had worked for the U.S. Postal Service for over 32 years . During his lifetime he married four times. I know very little about his first two wives, my mother was his third wife. His forth wife was Bonnie Robbins, who was the illegitimate daughter of my mother's grandfather! She was the "other woman" who was partially responsible for my mother's divorce. Her father was Jerome William Robbins. He had an affair with her mother and without getting a divorce from my great grandmother - married her and had the child, Bonnie Robbins. When Bonnie's mother found out he was still married she kicked him out. My father later married Bonnie but in the 1970's they separated and as many times as he tried, Bonnie would not give him a divorce. When he died in 1987, I still had the legal papers from his lawyer. Bonnie died in 2004 in Chicago, Illinois. Harold Teachenor had two children, both by Lucille Robbins Allen Teachenor. My sister, Suzanne Lee Teachenor was born March 29, 1946 in Pontiac Michigan and died December 21, 2000 in Tifton, Georgia (in a car accident which also killed her husband, Gregory Ticzkus) . As his only living child, I will not enter my information other than to say I was born after Suzanne.